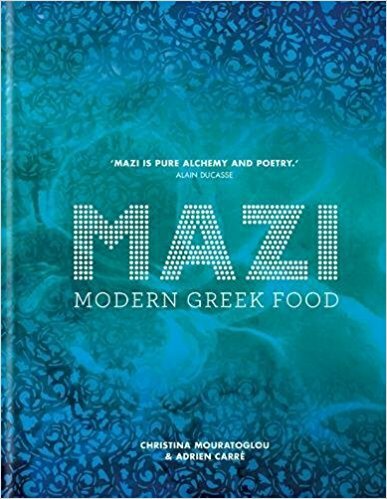 In MAZI, Christina and Adrien introduce authentic Greek flavours with their own innovative twist. Placing a strong emphasis on sharing a feast of small dishes, they introduce tapas style recipes exploding with flavour, yet relying only on the finest fresh ingredients and simple techniques to achieve the best results. with Globe and Jerusalem Artichokes; King Prawn Saganaki with Ouzo and Metsovone; and Giouvetsi with Braised Osso Buco. to showcase the sweet side of their cuisine and bring Greek desserts to the attention of the world. Recipes include Pistachio and Mastiha Parfait; Date and Meringue Tourta; and Tsoureki Fondant with Greek Coffee Ice Cream. Their hearty recipes to share blend the traditional and the new. This is a new look for Greek food: effortlessly edgy and completely delicious.